The ever increasing amount of data and computational capabilities in the cheminformatics field has led to a scenario where efficient techniques for storage and processing in an integrated, modular, and easily accessible platform are in vital demand. Here, we present ChemicalToolBoX, a compilation of more than 30 tools integrated into a single computational chemistry and cheminformatics platform based on the Galaxy workflow management system [1, 2]. We have recently designed a workflow within the ChemicalToolBoX to generate a library of compounds containing around 70 million unique commercially available small molecules, i.e. the purchasable space . 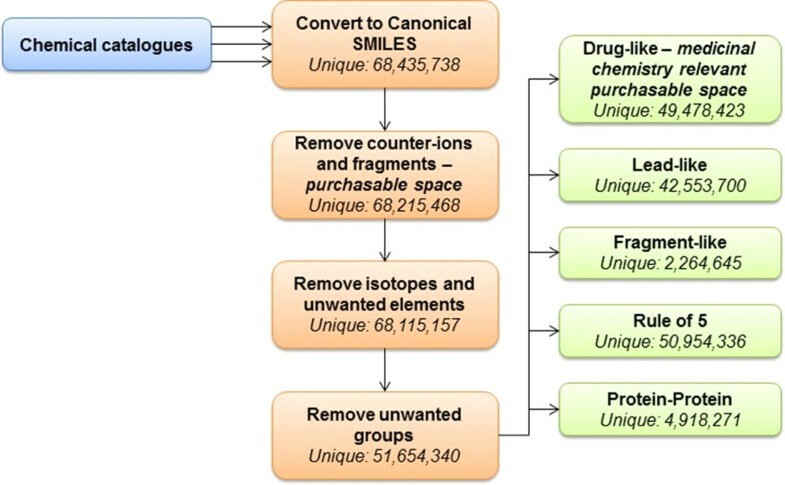 Subsequently, we have used filtering rules based on structural patterns and chemical alarms to discard problematic molecules, representing a very large portion of the drug-like and purchasable space, along with other drug discovery data sets including more than 2 million fragments (Figure 1). Furthermore, we have computed several physicochemical descriptors to discover general trends applying to each subset.